Born in Birmingham and educated at Elstow School, Bedford, and then at University College, London, and qualifying there as M.R.C.S. and L.S.A. in 1880, taking the M.B. Lond. with honours in 1882, the M.D. in 1884, and the M.R.C.P. Pratt came to Leicester as a House Surgeon at the Leicester Royal Infirmary in 1880, and was promoted to Consulting Physician in 1899, serving in this capacity through to his retirement, except for the period of World War I, during which he was a temporary Lieutenant-Colonel in the Royal Army Medical Corps. After World War I he acted as medical specialist to the Ministry of Pensions. 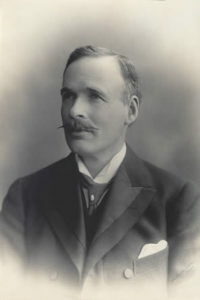 He joined the British Medical Association in 1887, and in 1905 was chairman of the Leicester Division, serving also in that year as Vice-President of the Section of Medicine at the Annual Meeting held in Leicester. In addition to his Lit and Phil presidency also served as President of the Leicester Medical Society, President of the Leicester Branch of the British Medical Association, President of the Leicestershire Golf Club, Chairman of the Leicester Charity Organisation, and was the Founder Chairman of the Leicester Branch of the Society for the Prevention of Tuberculosis. No Presidential Address published, perhaps because only a few months earlier he had already given a major lecture to the Society: The Municipal Control of Tuberculosis Transaction LLPS Vol.7 pt.4, April 1903, pp. 160-167. Sources: Pratt, Reginald (Dr.) Who’s Who in Leicestershire (Worcester: Bayliss, 1935); Obituary: British Medical Journal, Nov. 13, 1937, 2 (4010), p. 998.